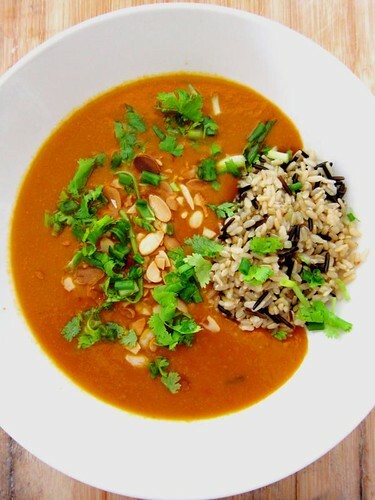 When we think about curry, we are dreaming of this thick, golden brown liquid that embodies a lot of spices and heat. Burmese’s curry is the exact opposite–it is usually quite thin (and at times, hardly any liquid), and contained very little spices. However it does not mean Burmese’s curry ain’t tasty. The traveller’s eggplant curry is quite easy to prepare. And it doesn’t take too long to cook. I was rather surprised when I first tasted this curry. When I looked at the gravy, I thought it will taste boring. No! You get the fragrance from the shallot and anchovies, and all the flavours are soaked up by the eggplants. This dish is actually quite rich but the acid from the tomatoes help to tone it down. Because the curry is not chock-full of spices and chillies, you can still taste the flavours of the core ingredient. And for those who fear of heat in their food, Burmese’s curry is a good place to start. It is now a staple at my dinner table. I love eggplants but I always fear of eating really bitter ones. Initially I was thinking of salting the eggplants before cooking (to get rid of any bitter liquid). It was not necessary at all. 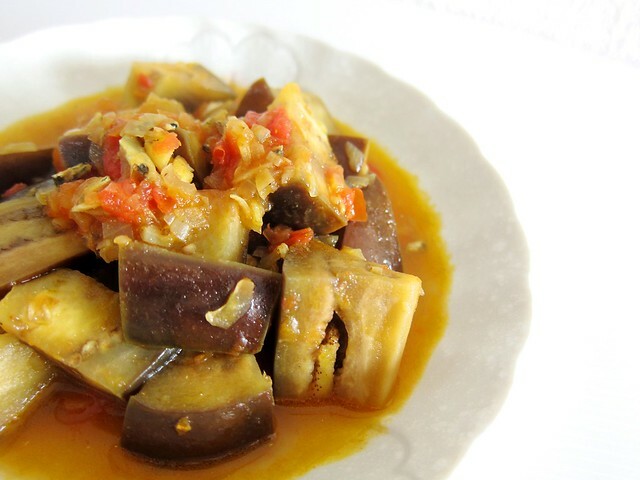 As long as the eggplants are well-cooked, the sweetness from the anchovies will penetrate into them. 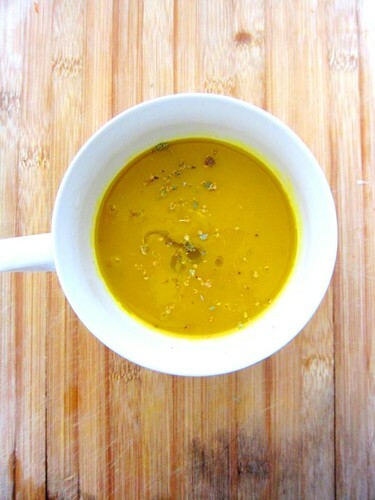 - Place a medium-sized saucepan or wok over medium low heat, and add in the oil and turmeric. Once the turmeric starts to sizzle, throw in the minced shallots. Do a quick stir and ensure the shallots are all coated in the turmeric oil mixture. 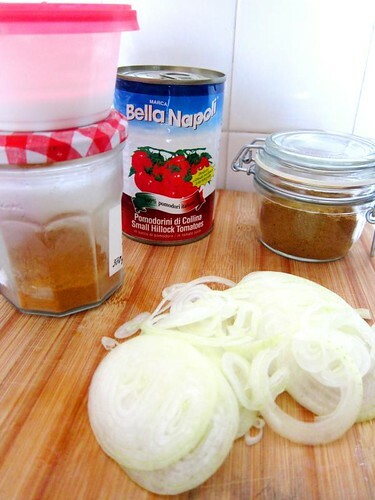 - Stir shallots occasionally for around 3 minutes. Once soften, add in the minced ginger and tomatoes, and cook for another 3-4 minutes. If the mixture looks a bit dry, you can in a few tablespoons of water. - Once the ginger softens, add in the eggplants. Stir and make sure that the eggplants are well coated in the tomato mixture. - Once the eggplants are coated, add in the minced anchovies and water. At this stage, increase the heat to medium high, and let the curry comes to a boil. Once boiled, lower the heat to low and let it simmer for 5 minutes. - After 5 minutes, season the curry with salt, fish sauce and chilli oil (if using) accordingly to taste. - Once seasoned, let the curry cooks for another 15 minutes. If you like your eggplants to be very soft, let the curry cooks for a further 15 minutes. I prefer mine to retain a bite. - At this stage, you can adjust the seasoning accordingly to taste. I usually just add a bit more water so that I can have more gravy. Once seasoned, serve warm with rice. It’s Honey Boo Boo Day! I am a huge fan of Alana Thompson aka Honey Boo Boo Child. For those who are unfamiliar with Alana, she is a 7-year old girl who lives in McIntyre, Georgia and loves to participate in beauty pageants. She was first featured in TLC’s Toddlers and Tiaras. And she was such a hit that TLC decided to do a spin-off called Here Comes Honey Boo Boo Child which features Alana’s everyday life and her family. When I first watched snippets of this show, I was actually pretty annoyed by this family. They were so loud. And I just gave up watching. With the encouragement from friends (you can tell my standard for friends is pretty low), I persevere and I fall in love with this show. A little disclaimer here – not everyone will like the show. I have friends who are amazed such families exist. For me, the reason why I like the show is that Alana and her family look genuine. Their conversations, actions may seem weird but they sound and look real. Most importantly, there is no ridiculous drama in this family. They just cry, laugh, talk, smile and fart (I truly believe this is the first time I used the word “fart” in my blog). A couple of months back, my friends and I organised a “Honey Boo Boo Day”. We were going to cook some food and do a Honey Boo Boo marathon. Since I would be bringing my dish over to my friend’s house and we were doing lunch, I needed something that was quick to cook, easy to assemble and portable without fuss and spill. 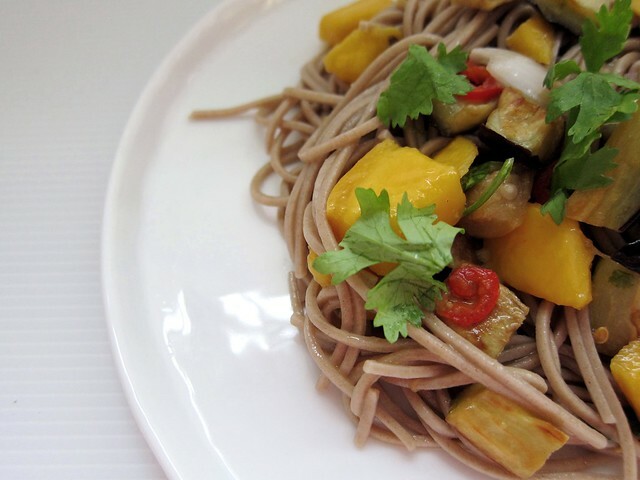 I finally settled on Ottolenghi’s soba noodles with eggplant and mango (of course, nothing makes me happier than a visit to my mango man. He sells really good, dirt cheap mangoes at Tekka market. His honey mango is only S$1 each). Before I served this dish to my friends, I must do a trial-run – to test and adjust the flavour, and get myself familiarise with the recipe. The flavour of this dish is unbelievably amazing. The first taste, it reminds me of yusheng – it is tangy, sweet and slightly spicy. It is so refreshing that when I reach the bottom of the mixing bowl (it is so good that I cannot be bothered to plate it), I can feel my stomach weeping. You can make this dish two hours in advance. If you are bringing this to a friend’s house (like me), add ¾ of the dressing into the noodles. Once you have reached your friend’s place, and when you are about to serve the dish, add in the rest of the dressing. The noodles might stick together when resting in the fridge so the dressing helps to loosen them. - In a small saucepan, add in the rice vinegar, sugar and salt, and place it over a low heat. Using a spoon, gently stir the vinegar until the sugar and salt are dissolved. Once dissolved, remove the saucepan from the heat. - Pour the vinegar mix into a bowl (or the container that you might use if you are transporting this dish to a friend’s house), and add in the sesame seed oil, garlic and chopped red chilli. - Once the mix is cooled*, add in the lime zest and juice. If you add in the zest while the mix is warm, the heat will discolour it. Set aside. - Preheat the oven to 200oC. Place the diced eggplant on a baking tray, add in the vegetable oil, mix well and make sure they are coated with the oil. Place the baking tray in the oven and bake for 10-15 minutes or until they turned golden brown. - Once the eggplant is baked, place them in a colander and sprinkle generously with salt and leave them to drain. - In a medium-sized saucepan, fill it with water (enough to cook the noodles) and place it over a medium heat. Once the water starts to boil, add in a generous pinch of salt and the noodles. Cook the noodles as per instructed on the pack. Mine takes about 6-8 minutes. The cooked noodles should be soft yet with a bite. - While the noodles are cooking, remove the eggplant from the colander and place them in a large mixing bowl**. Using the same colander (there is no need for washing up), fill it with a tray of ice cubes. Set aside. - Once the noodles are cooked, drain (don’t use the colander, just drain from the saucepan) and rinse it with cold water. Drain again but this time, using the colander that is filled with ice. Mix the ice cubes and noodles – this is to prevent the noodles from sticking and stop further cooking. Set aside. - Once the noodles and eggplant are ready, you can slice and dice the mango. - To assemble, in the mixing bowl (with the eggplant), add in a tablespoon of the dressing, follow by the mango (the vinegar and lime juice will prevent the oxidisation of the mango). Add in the rest of the ingredients – soba noodles (make sure to drain off any excess water), onion, coriander and the dressing (remember if this is to be served later, reserve some of the dressing). You can use two forks or like Mama June (Alana’s mother) who believes hands are the best utensil, mix it with your (clean) hands. - To finish, garnish with more coriander. - If you are bringing this dish to a party, just pour in the rest of the dressing, mix and garnish. *While the vinegar mix is cooling, you can crack on the rest of the dish. **I am an advocate of use-less-bowl. However I will not recommend assembling or mixing this dish in the container or serving platter that you are going to use. You need a big bowl or room for you to mix all the ingredients and dressing together. And trust me, this will be less messy too.